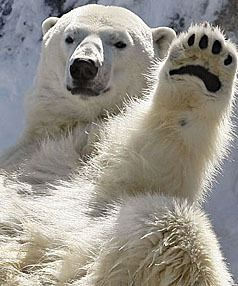 WAVE GOODBYE: There are 25,000 polar bears worldwide. The species is listed as threatened under the US Endangered Species Act because their sea ice habitat is melting. Life wont be easy once nemesis follows hubris, writes David Round. It was once a truth universally acknowledged that good times never last. But we now seem to consider ourselves immune from the laws of nature and history. Times have been good and getting better for most of our lifetimes. All but the very poorest of us enjoy comforts beyond our grandparents wildest imaginings. We cannot imagine anything but the good life. But actions have consequences, and if even half the articles we read in this newspaper every day are actually true  and surely The Press does not lie  then chickens are rapidly coming home to roost. We face the end of cheap and abundant oil, on which our entire civilisation and way of life depends. Oil we cannot afford is, for most purposes, little different from no oil at all. No adequate substitute exists. How will we manage if we cannot even get to work in the morning, and bring the groceries from the supermarket, let alone send our goods to the other side of the world and bring large numbers of tourists here? There is no doubt significant global climate change is happening. The challenge to climate change science recently whipped up by vested interests is only a quibble over a couple of footnotes. We will inevitably see more extreme weather events, crop failures, famine, economic collapse, mass population movements and war. The earths human population increases each year by some 90 million, all of them wanting not just life but a life as good as ours. As all of this happens, we are running out of the most basic resources; not just oil, but water, soil and fresh air. And even nearer to hand is economic collapse, both national and international. New Zealand has been living beyond its means for decades, and sinks deeper into debt each year just to keep things ticking over. Is it possible to imagine ever paying the money back? What happens when credit dries up, as sooner or later it must? Many other countries are already beginning to taste the crisis that awaits us. These crises, inter- related and feeding off each other, are beginning to bite now. No government can solve them. They are simply a consequence of the way we live. They are the nemesis that always follows hubris. Two questions arise. First, is it possible to avoid this perfect storm of calamities? I doubt it. One thing alone will save us  not law, or politics, but universal and immediate self-denial and restraint in most nations, rich and poor. This will not happen. We show no inclination whatsoever to live more lightly on the Earth; indeed, quite the opposite. In any case, unless the rest of humanity were to join us at once, New Zealand would merely have put itself at a self-imposed and pointless disadvantage. So, calamity is well-nigh certain. New Zealand may not suffer as badly as many other places, but our future will be far harsher and poorer. We will simply not be able to afford a fraction of todays health, education and social welfare arrangements, holidays and recreations, luxuries or even some basic comforts. We will not be able to afford prisons, even though the crime rate will almost certainly rise. Life in large cities, in particular, will be inconvenient and unpleasant. So the pressing second question is: how will we survive? What will we eat, and how will we obtain it? How will we make a living? Where and how will we live? Who will keep the peace and who defend us? The simple answer is, that like most communities throughout human history, we will have to do most of these things for ourselves. This will not just be a matter of growing our own meat and vegetables, although that will be challenging enough. We will not be able to rely nearly as much on paid professionals  teachers, policemen, nurses, social workers, administrators and so on. We will have to return to older social arrangements whereby most necessary social services were provided by what Professor David Korten calls the love economy. Money may be involved, but these services are provided by community members, rich and poor, out of their sense of obligation to their fellow citizens. We cannot live without social institutions, and so we must create our own. It will be difficult to fashion them from scratch, but we have many ancient models to draw on. Many of them  the forest laws, shire moot and hundred court, manors and feudal tenures, local magistrates, the posse comitatus, guilds, boroughs and local jurisdictions  we scarcely remember. Others  the family and the Church  are shadows of what they once were. We must fashion for the future, not merely recreate the past, yet when similar situations and problems arise, similar solutions naturally suggest themselves. In past social, legal, constitutional and economic arrangements, we can find ways to cope with future problems. We cannot even be certain that our future will be democratic. Underlying all democratic thought is the assumption of an abundance, or at least adequacy, of resources  that there will always be enough for everyone. The only issue, then, becomes one of distribution. But in a new age of scarcity, this assumption may no longer be valid. Equality will be impossible. On what principle, then, are we to administer society and ration resources? Our choice of future government is between a stern hierarchy and a truly vibrant, co-operative, genuine democracy. Outside these two options, there is only chaos. The precautionary principle is a wise environmental rule. Be cautious  do not allow innovation and development unless we can be certain that what results is an improvement, or at least a situation where the good outweighs the bad. This is the only principle by which a truly sustainable society can live. It is a conservative principle, in the true sense of that much misunderstood word. The essence of conservatism is holding on to the past until we can be certain that the future will be better. The radical temperament, by contrast, is arrogantly ready to jettison the painfully established institutions of the past for the dream of paradise just around the corner. But our ideas are all of a piece. We cannot, in relation to the environment, say, require that we should be cautious, while in other spheres of life we take the opposite attitude that we should be free to do whatever we like. Inevitably, one philosophy prevails. We will be conservative  conservationist  in our environmental attitudes only if we take the same conservative approach in all our living. Ours has been a glorious age of untrammelled, irresponsible, individual liberty. This must soon end. That may perhaps seem the most grievous price of all to pay for community, and the most difficult to make, for that liberty too seems second nature to us. Yet the price must be paid. David Round is a lecturer in environmental law at the University of Canterbury. He will present a public lecture on Legal, social and political options in an age of environmental crisis next Wednesday, March 24 at 7pm as part of the School of Laws The Law and You series. For more information, including venue, phone 03 364 2987 ext 4860. Next weeks Good Living has a special focus on the environment ahead of Earth Hour on March 27.